48-year-old male patient referred to Illinois Retina Associates for evaluation one month following blunt ocular trauma, inflicted when a bungee cord released suddenly and struck him in the left eye and left side of the face. The patient noted sudden, profound reduction of vision immediately following the incident, which seems to have gradually improved. He also noticed a large red floater following the incident, which has since become smaller and moved more inferior in his field of view. The patient is otherwise healthy with no significant past medical history or past ocular history. OCT was performed, which demonstrated an RPE disruption with a small foci of overlying subretinal hyperreflective material, but an absence of subretinal fluid, in the nasal left macula. Macula OCT of the right eye was unremarkable (Figures 2 & 3). Fluorescein angiography of the left eye showed a normal transit, but an early hyperfluorescence of the lesion mentioned, consistent with window defect. 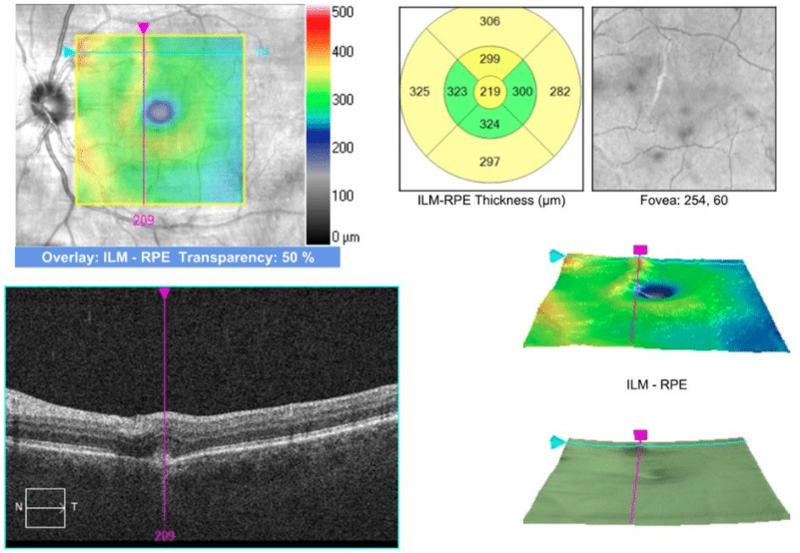 Transit of the right eye revealed late leakage at the superior aspect of the lesion, suggestive of macular edema, likely secondary to choroidal neovascularization (Figure 4). 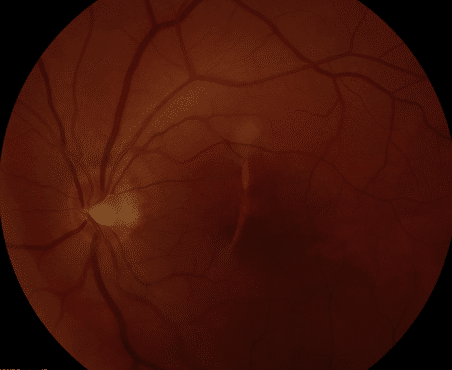 A well-defined hypopigmented streak with an RPE and Bruch’s membrane disruption noted on OCT, as well as concurrent window defect and an associated focus of late leakage on FA, is strongly suggestive of choroidal rupture with secondary choroidal neovascularization, particularly in the context of new symptoms immediately following trauma. Choroidal rupture is a relatively commonly occurring entity in blunt ocular trauma. Rupture can be a direct result of traumatic forces, occurring at the site of impact, or an indirect effect, secondary to forces transferred through the vitreous or walls of the globe.1,3 The latter is more common. Most frequently, the rupture occurs temporal to the disc, often times within the macula. The classic curvilinear hypopigmented fundus lesion attributed to choroidal rupture represents a disruption of both Bruch’s membrane and the overlying RPE. This can be associated with subretinal hemorrhage and subsequent choroidal neovascularization, as in this case, but most often vision loss immediately following the injury can be attributed to concurrent vitreous hemorrhage, in which case vision improves gradually as the hemorrhage clears. Final visual prognosis depends on the location of the rupture relative to the fovea, as well as the presence of sequelae such as choroidal neovascularization and subretinal scarring. There is no treatment at this time for the choroidal rupture itself. 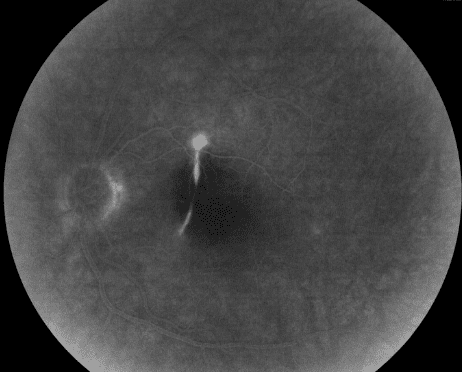 However, development of choroidal neovascularization as a result of the rupture can be addressed effectively with anti-VEGF agents, or in some cases photodynamic therapy. 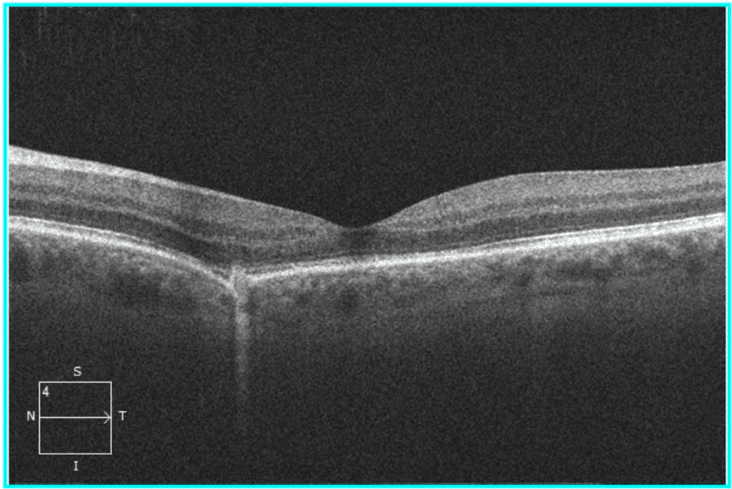 Previously, submacular sugery was undertaken for large choroidal neovascular membranes with significant visual impact, but this has fallen largely out of favor since the advent of anti-VEGF injections due to their dramatic efficacy and relatively minimal potential for adverse effects. 1. Ament, C. S., Zacks, D. N., Lane, A. M., Krzystolik, M., D’Amico, D. J., Mukai, S., … & Miller, J. W. (2006). Predictors of visual outcome and choroidal neovascular membrane formation after traumatic choroidal rupture. Archives of ophthalmology, 124(7), 957-966. 2. Gross, J. G., King, L. P., de Juan, E., & Powers, T. (1996). Subfoveal neovascular membrane removal in patients with traumatic choroidal rupture. Ophthalmology, 103(4), 579-585. 3. Wood, C. M., & Richardson, J. (1990). Indirect choroidal ruptures: aetiological factors, patterns of ocular damage, and final visual outcome. British journal of ophthalmology, 74(4), 208-211.